This Psalm is essentially a proud affirmation of the great qualities and achievements of Am Yisrael. The Levite poet Assaf begins by declaring, "Hodinu Lecha Elokim, Hodinu" ("We give thanks to You, O God, we give thanks" – verse 2), which Rashi explains to mean that we give praise to God both for joyous events as well as when misfortune strikes. Our sense of gratitude and appreciation for God's greatness is unconditional; even when He appears to treat us harshly, when the fairness of His judgment strikes us as questionable, we remain firmly devoted to Him and His Torah. 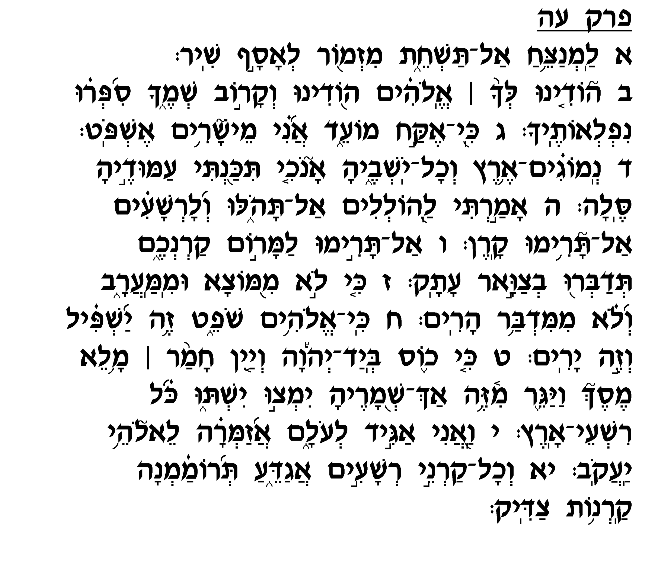 In verse 3 (according to Rashi's interpretation), Assaf takes pride in the way Am Yisrael celebrate their festivals, the Yamim Tovim: rather than engage in frivolous, immoral behavior, we devote the day to giving praise to God and drawing closer to Him through prayer and Misva observance. Then, in verse 4, Assaf speaks of what is perhaps the nation's most glorious moment, the acceptance of the Torah at Sinai, through which the world achieved its purpose and in effect earned its right to continued existence. In verses 5-9, Assaf dismisses the arrogant claims of the wicked peoples of the earth who trust in their own material accomplishments rather than in the power of the Almighty. As God is the one, true judge over the earth, Assaf is unnerved by the hubris of these tyrants: "For God is judge – this one He lowers, this one He raises" (verse 8). In an instant, the wealthy and powerful rulers can fall, and the lowly peasant can ascend to prominence. Therefore, as the Psalm concludes, we must continue the campaign to oppose evil and treachery, and to support the cause of the righteous. The temporary success of the wicked and powerless state of the righteous should not discourage us from resisting the efforts of the former and following the example of the latter. This Psalm demonstrates that while we must certainly feel humble and unworthy before God, we must at the same time sense a degree of confidence and resolve in our mission. As Jews we must take pride in our past and in our unshakable commitment to justice and righteousness, and draw from this commitment the strength and encouragement we need to continue in our campaign to fight evil and advance the cause of morality and virtue.